Deutsche Gesellschaft für Materialkunde e.V. : Call for Abstracts for the 5th CellMAT 2018. Don't miss the deadline to submit your abstract: 31st March 2018! 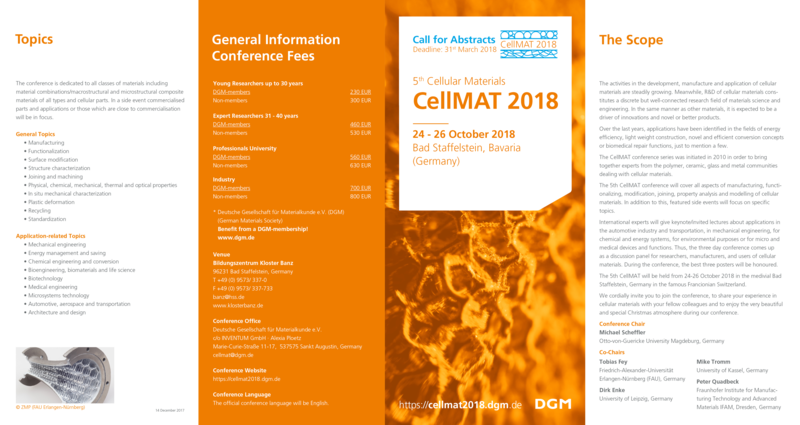 The CellMAT-Cellular Materials takes place from 24–26 October 2018 in Bad Staffelstein, Bavaria (Germany). The activities in the development, manufacture and application of cellular materials are steadily growing. Meanwhile, R&D of cellular materials constitutes a discrete but well-connected research field of materials science and engineering. In the same manner as other materials, it is expected to be a driver of innovations and novel or better products. Over the last years, applications have been identified in the fields of energy efficiency, light weight construction, novel and efficient conversion concepts or biomedical repair functions, just to mention a few. The CellMAT conference series was initiated in 2010 in order to bring together experts from the polymer, ceramic, glass and metal communities dealing with cellular materials. The 5th CellMAT conference will cover all aspects of manufacturing, functionalizing, modification, joining, property analysis and modelling of cellular materials. In addition to this, featured side events will focus on specific topics. Here you will find the list of topics. The CellMAT 2018 will be held from 24-26 October 2018 in in Bad Staffelstein, Germany, a small city with mediaeval charm in the famous Franconian Switzerland. Abstracts are to be submitted by March 31, 2018 at latest through the conference website. International experts will give keynote/invited lectures about applications in the automotive industry and transportation, in mechanical engineering, for chemical and energy systems, for environmental purposes or for micro and medical devices and functions. Thus, the three day conference comes up as a discussion panel for researchers, manufacturers, and users of cellular materials. During the conference, the best three posters will be honoured. Especially young scientists are very welcome to submit a contribution and participate actively in this conference. An exhibition will be held in conjunction with the conference. Coffee breaks, lunch and poster sessions will be held in the exhibition area. Are you interested in supporting the CellMAT 2018 conference and in presenting your company/institute? Please feel free to contact the conference office for any questions or proposals regarding your company’s presentation. We cordially invite you to join the CellMAT 2018 conference, to share your experience in cellular materials with your fellow colleagues and to enjoy the very beautiful and special location, the monastry Kloster Banz in Bad Staffelstein (Bavaria).